April 19th will mark exactly three years that I’ve been a pet-toting walk-on passenger with BC Ferries. In that time, I can truly say much has changed but that so much more has not. In these three years I’ve become part of an unspoken community of canine lovers, meeting in the bowels of BC Ferries’ ships. We’ve found camaraderie through our stories and our lamenting over our steely situations. At times we’ll watch each others’ dogs so we can take turns making a run for the bathroom. Watching our dogs wrestle WWF-style with each other always brings out laughter! Sometimes during the Christmas season, someone will be thoughtful enough to bring along some Baileys Irish cream, topping up all our coffee cups to stave off the cold air. We’ve learned to survive together and make do with the hand we’ve all been dealt together. And I get it – our problems are the definition of “first world problems.” That fact has not escaped me. When I first adopted Jordy and was instantly relegated to crossing the Georgia Strait on one of the car decks, a few issues reared their ugly heads from the first voyage. On adoption day, Rebecca was with me and nabbed a video of the Coastal Renaissance’s pet area. Little did I know at the time that that was as good as it would get. Following that maiden voyage, I started to blog about the pet areas on BC Ferries. I sent e-mails to head office and even to one of the captains on my usual route. I had phone conversations with customer service. It was never just about me – I was attempting to pioneer change on behalf of any and all dog owners. Within a year, change had started to spring up on the vessels! A new dog area was installed on the fourth deck of most vessels, enclosing the pet-toting passengers, providing heat lamps and shields from the wind. It was definitely a start, and it was a great one. BC Ferries has become increasingly responsive in dialoguing with the public, particularly on their Twitter account. Suggestions I’ve made in my correspondence with the ferries have, in fact, been taken into account. It’s fantastic to see, particularly because they’re a company with the responsibility of public accountability. Like anything in life, there’s always room for improvement. After riding on the Horseshoe Bay to Departure Bay route this past Easter weekend, some of the needs were glaringly obvious. On Good Friday, I counted at least 12 dogs plus passengers with enough room in the pet area for only four or five dogs. Disgustingly, I had no choice but to sit on the floor. As ferry fares increase, more and more riders will be ditching their vehicles and walking on. BC Ferries simply must acknowledge this fact and make the safety and space amendments that are necessary. Simple improvements to the comfort level on the car decks really isn’t asking for too much either. If you’re a pet owner, a ferry traveler, or both, please consider popping a quick e-mail to the Ferries. Change has started, so let’s keep the ball rolling! I also think that pets that are in a carrier (crate) and therefore not loose should be allowed on the passenger decks with their owners. I know for large dogs this is not helpful, but I have an 8 pound dog that can easily be carried by me in a small plastic crate and brought up to the passenger area. It’s less intrusive then most strollers and allows me to be warm and comfy and for her to be with me and safe and happy too. No reason to NOT allow them if they are in a kennel/crate as far as I can see. Good job and I will contact BC Ferries in support of dog owners. gosh, a proper room! What luxury. You should ride on a spirit class vessel. For years there was nothing. On a bad day the stairways were a bad alternative. 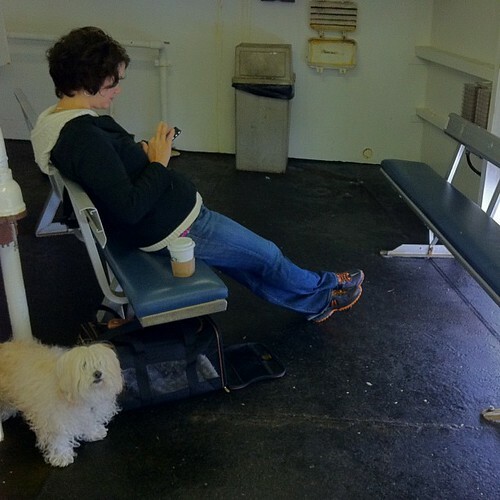 Last time I traveled with a dog on a spirit class vessel, several years ago now, but definitely more then three, they had actually put up some (still drafty and very frigid) partitions and a couple of poorly placed benches. One of them under a fire hose box, resulting in a nasty gash of a fellow passenger when he got up and caught his head on the corner. That is the bad BCF side of things. On the dog hauling passenger side of things… why can they not pack out what they bring in, ie their trash?! How rude to leave it. Waste bins or not. If you could haul in the food or drink item, surely you can haul out what is left of it. Why potable water? Your dog cannot go without a sip for an hour and a half? Ridiculous requests like these (any idea on the cost of plumbing to a location like that?) might help get some of the more sensible features installed. Ie tie up rings on the walls so that you can make a trip to the facilities in case you are the only traveler with a dog that time. Making the staff toilet available to the dog toting public seems like a simple enough solution to that issue too. As to sanitizing spray… I am on the fence on that one. Unfortunately people can be too selfish and at times down right irresponsible and will travel with a dog that really should not be taken into any public setting or may be sick or host parasites. IMO BCF should charge a small fee for walking on with a pet but then use the funds to provide better facilities, and also state clearly what is expected of the pet owner. In Europe that is routinely done so when you take your dog on a train for example. Your dog has to have its own ticket, usually half of the adult fare. So in light of that… considering that pets are non-paying passengers, it is probably a decent trade off. I for one would gladly pay a little extra for a *proper* passenger area dedicated to pet owners. For the most part, I definitely agree, Dani. In a nutshell, because pet passengers pay as much as every other passengers, we should have access to the same safety measures and basic facilities as all other passengers. Though that said, I would most definitely be willing to pay a bit more for my pet if the money went to greatly improving the standard of the pet areas on the vessels. Thank you for your hard work and solid voice for the pooches and their friends! I will be a newbie at walking on with my dog, 2 kids and a trailer this weekend?! oh boy! I’m dreading it already – but fingers crossed, hoping to have a cushy seat during my travels. I am so glad I came across your blog. It is Thanksgiving weekend and my boyfriend and I are taking our sweet doggie across as a walk-on for the first time (to clarify we’ve walked on w/o pup before). I’m feeling more prepared knowing what to expect from the details in your blog, and also less prepared with what I’ve packed (I feel I should bring a camping chair to sit in, along with warm blankets!). I find the ferry cold enough when sitting on the passenger decks, so I made sure to wear boots and my wool jacket while in the dog area. In regards to your blog posting, you’ve brought up some good points. I don’t see why BC Ferries wouldn’t supply a more “friendly” room for dogs and their owners. Yes we have dogs, but we are still passengers. I’m not one to sit quietly, so if there are any improvements to suggest, I’ll be happy to send BC Ferries a friendly suggestion via email. Wish us luck on our adventure tonight! Does anyone know if dogs are allowed on the top deck of the ferries. If good weather that’s a nice place to be and you’re not in that tiny room. I am travelling from departure bay to.horseshoe bay in a while and am.walking on with my 10 month old cat, who has a kennel. I am kind of nervous now to do this after reading all of these comments and the post itself. I just was doing a google search in preparation of taking my 7mos old 50lbs golden doodle on the ferry this weekend. I am not sure what to expect, I have lived my life, blissfully ignorant of travelling with a dog. But here I am now a dog owner, and surprised by the lengthy restrictions for pet owners and their desire to allow them to experience all that a family pet should! So this weekend I will be walking on, with Nahum, and all his and my gear, and i’m glad to have come across your article helping me to mentally prepare for our journey! Thank you for all the hard work you have done in getting things moving for us dog owners! Hi I am a bit annoyed at the whole issue of not being able to sit comfortable with your pet with you. What the heck is wrong with bc ferries. Is there not any dog lovers who work for fferries? Come on and get real for a minute. Yes dog’s can be distracting and maybe cause a bit of disturbance but they have a heart and they are living breathing animals. At least get real here. Sure the little area is fine but why can’t the bc ferries be kinder to animals and let the owners of these animals also be comfortable, We pay enough into all of this to go across. can’t you (ferries) give something back to your passengers including the animals. I don’t have a pet, but I’d like to suggest you try another tactic. It seems to me Transport Canada would have something to say at least about life jackets not being readily available to people on the car decks with their animals. Perhaps you should contact them. Well, after reading the posts above I will have to advise my 83 year old mother NOT to take along her 10 pound companion as a walk-on. My mother has some minor mobility issues so my sister, who lives on the Island, will come over as a walk-on to meet my mother who was hoping to bring her dog along for the 2 week visit. There is no way that she would be able to spend that much time in a space as described above, even in one direction, let alone the return trip. I guess my dog will have a little playmate for two weeks. Separating my mother from her pet for two weeks is going to be tough enough. BC Ferries really should address this matter and yes, we would certainly pay an additional fee for the dog if in fact it would mean improvements in comfort and safety for the walk-on passenger travelling with pets. I am walking on with my dog for the first time this weekend. I usually drive so stay in my car with her, then I can at least go up and use the facilites and get a coffee. I am dreading the fact that there are no conveniences nearby when in the pet room. I don’t see why we cannot take pets upstairs as long as they are in portable kennels or pet carriers. I travelled with her on an airplane ride that was 4 hours long – she was in a carrier under the seat in front of me and never made a peep, yet BC Ferries conditions are almost Barbaric in nature. 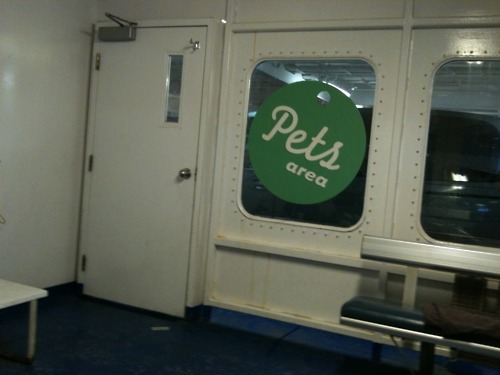 i remember we were so excited to find out they were putting a dog area on the ferry, we thought great! about time, my grandma can come visit with her dog with out paying to bring the car and spending all that money, then i took my first trip with my dog, and thought no way i will let my 70 something sit in this disgusting room, luckily my mom moved out to her and i just go there but still come on! i have emailed them time and time again, when my grandma was still coming out here to visit.